This leaves a lot of unanswered question as well: First fo all, do we really practice zazen to attain inward peace and relaxation for ourselves? Isn't it also about saving all suffering beings right from the start? If so, it would make not much sense to call the practice of a beginner "passive" or "inward" and that of a bodhisattva "active" or outward". Both have to aim at a balance of both aspects. Also, as we saw in the December issue, Indian statues always show the right side up - even when it is a statue of Shakyamuni before his enlightenment. If the common interpretation was true, we would expect Shakyamuni to sit with the left side up when he was still engaging in his ascetic practises. 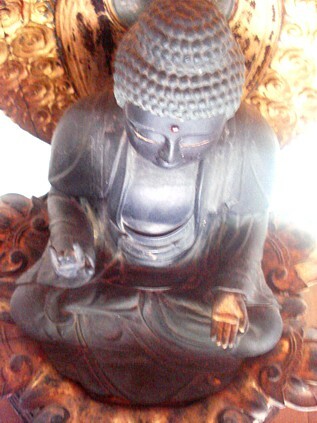 Some Buddha statues that originate in China though have the left side up. 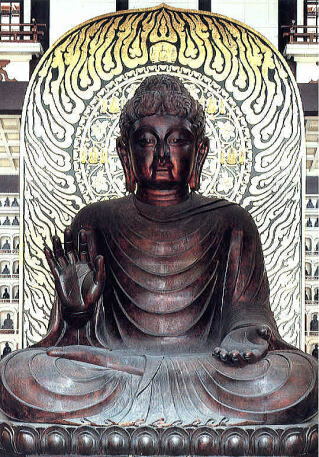 The one in Antaiji is one example, and the great Buddhas in Nara or Echizen (below, left and center) also depict the Buddha (in this case Vairocana) with the left foot up.